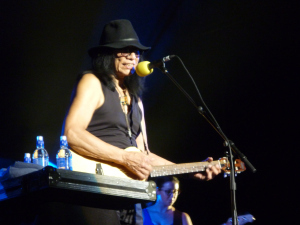 Rodriguez (Logan Campbell Centre, Auckland, 17/03/13) [Concert Review] | Shut Up Hamish! Most people know the story of Sixto Rodriguez by now; a Detroit folk singer who released two critically acclaimed but commercially unsuccessful albums in the early 70s, who disappeared from the music industry for thirty years to work as a labourer and pursue a University education, only to be contacted in the late 90s with the news that he was huge in South Africa. Those South African fans had thought him dead, and when he travelled to the Africaan country to perform some shows soon after, he had know idea the huge crowds and the star treatment that would await him. The documentary however left out the fact that he had a fanbase in Australia and New Zealand and had already toured down under in the late 70s. Never-mind, the documentary tells a good story and is largely responsible for the worldwide resurgance of interest in this once obscure singer-songwriter. Some of his old fans and many of his new ones turned up last Sunday night to see the man, the enigma, the street boy in person. Rodriguez himself didn’t disapoint, offering versions of his classic songs delivered with a voice that sounds like it has not aged at all in the last forty years. Accompanying him were a group of New Zealand session musicians who provided authentic reproductions of the arrangements found on the original albums. 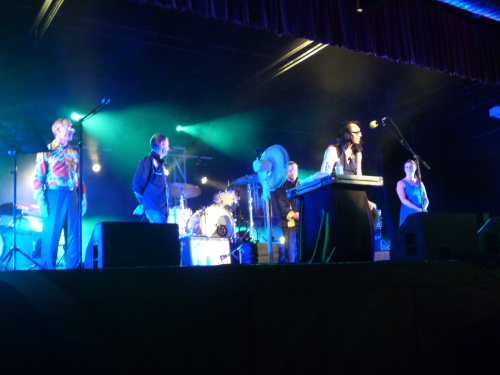 Yet perhaps due to the musicians not being completely comfortable with the material, probably having learnt it only days or hours before, or perhaps due to Rodriguez’ increasingly frail demeanour, the concert did not explode with a terrible amount of urgency. This could have also been due to a fairly passive crowd, who largely remained seated for all 90 mins of Rodriguez’ performance, in spite of yells from many hecklers pleading with the crowd to stand up. I myself wondered why they didn’t stand. As Rodriguez performed classic after classic off his first two albums, such as I Wonder, Only Good for Conversation and Sugarman I could not help but rise and find a position in the aisle where I could dance and sing along. This could be a problem with seated gigs in general; or with concerts that attract a largely middle aged and over demographic. Rodriguez communicated with the crowd between songs by telling jokes, offering humourous wisdom and looked dapper in a black outfit and shades. Age may have taken away much of Rodriguez’ sight but none of his style. While the audience gave a tepid response during songs, they redeemed themselves by expressing their enthusiasm as Rodriguez limped off the stage, helped by his guitarist and some of the road crew. After an extended standing applause, Rodriguez found his way back to the microphone to deliver two more songs. First a cover of Bob Dylan’s Like A Rolling Stone, sung probably closer to the album version than Dylan himself will ever peform live and finally I Think Of You off the singer’s second studio album. It was a tender finale, and as Rodriguez cautiously made his way off the stage, I was left to wonder how the man’s career could have been different if he’d only have the chance to tour like this forty years earlier.